In The Happiness Project, Gretchen Rubin describes her year of trying to become happier. Each month, she focused on a different aspect of life in order to systematically define what makes a person (or at least one person) happy. Interestingly, she began by cleaning out her closets. Her theory was that we each have so much “stuff” cluttering up our lives that it creates a feeling of chaos, disorder, and overwhelm. She intentionally left one shelf in each closet empty, to let her psyche feel a sense of spaciousness, to indicate she had room to spare and room to grow. Gretchen also realized that not only was her home cluttered, her mind was cluttered. So she made a list of all those things that stay on her “to do” list but never seem to get done. She eliminated all those that seemed unrealistic or unnecessary and then scheduled time to do those that felt truly important or deserving. It’s always easier to look at what others can do differently. My husband should get rid of his old journals. My kids should take their memorabilia to their own homes. Being a firm believer in the idea that the only person we can change is ourselves, I looked over the garage, still full of unpacked stuff from our last move, trying to find things to give away or throw out. As my eyes drifted over the scene of boxes, athletic equipment, and various unrelated items, they came upon our son’s old tennis shoe. One of the first shoes he had ever worn. Since our son is 26, there is no chance it will ever have a use – except to serve as a sweet reminder of that darling little toddler. I remembered a brilliant idea that someone shared before our last move – to take a photo of each item whose memory we wanted to preserve, but which had no further usefulness. 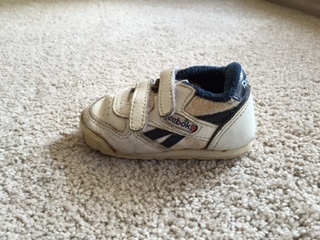 Click – the shoe is now solidly tucked away on my computer, easily accessible whenever I want to see it and reminisce about those early childhood days. I can’t say it didn’t feel sad to toss it into the trash. But I did it. One less item cluttering up our lives. What “yesterdays” can you let go of? What reminders do you want to keep – as memories, photos, or scanned documents? When can you spend a few hours actually doing those things perennially on your “to do” list, getting them off your list and out of your mind? What will it feel like to have more space in your life? This entry was posted in mindfulness, physician coach, physician coaching, physician communication, physician fulfillment, work life balance and tagged medical career, physician coach, Physician coaching, Physician fulfillment, work life balance. Bookmark the permalink.